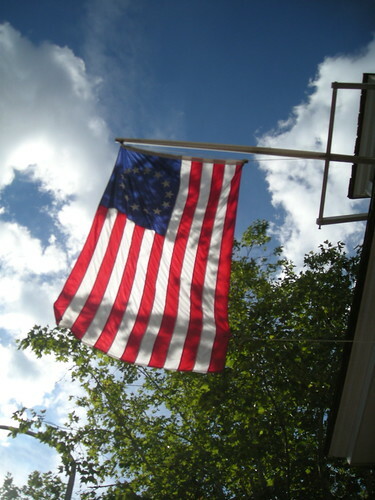 The 13 star flag, flying from the Betsy Ross House, 239 Arch Street, in Old City. You can enlarge this photo, and all others, by just clicking directly on the picture. 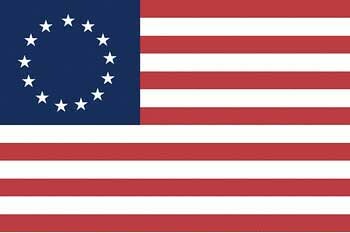 The Betsy Ross flag as a graphic design. A close-up of the flag - not all stars are visible. Another close-up - likewise, the entire circle is not visible. Grand Union Flag - The Union Jack’s inclusion in this flag, was intended to demonstrate the colonists’ desire to remain within the British Empire. (The war had started in April 1775, over a year prior to the Declaration of Independence on July 4, 1776.) They had hoped that the British would redress their grievances, and that independence would not be necessary. Betsy Ross, presented by a re-enactor. 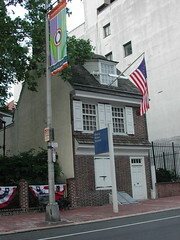 The Betsy Ross House, with the 13-star flag flying. An interior view of the basement kitchen – the Betsy Ross House. All three thumbnail images above are photos, courtesy of the Betsy Ross House, taken by George Widman. 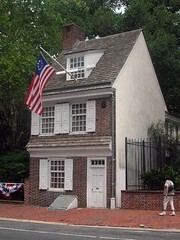 The exterior of the Betsy Ross House. 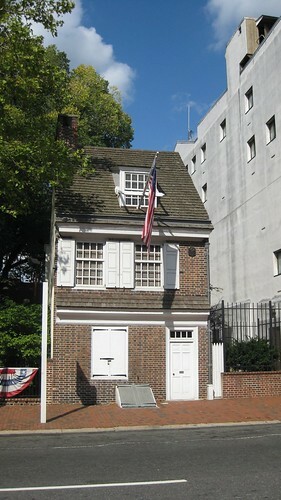 Another view of the exterior of the Betsy Ross House. A direct picture of the front of the Betsy Ross House.